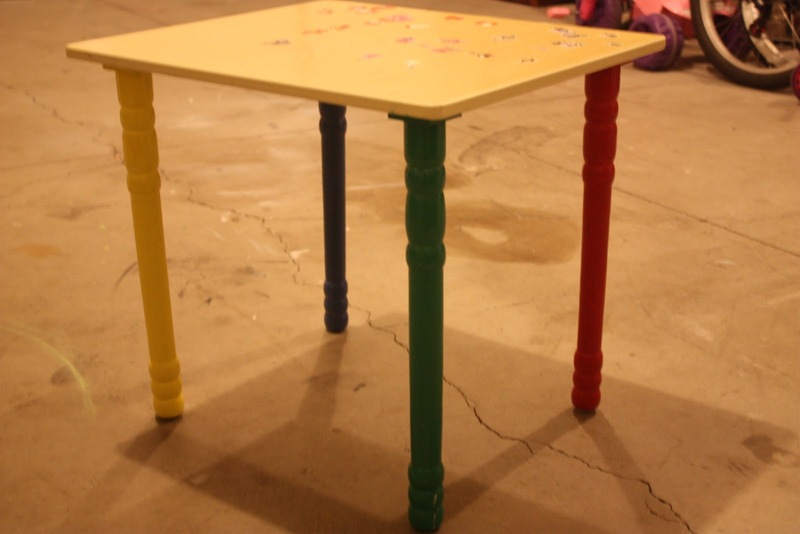 EEEEEKKKKK a tiny UGLY toddler table covered in stickers and STILL had primary colored legs, pretty sure every other house has one! We have had this darling little table since our 7 year old was a baby but it is just so small barely fits a coloring book let alone crayons! 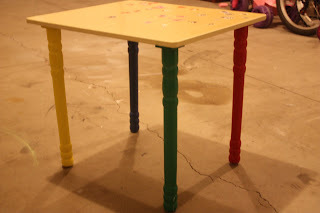 I have been meaning for YEARS to paint those legs but it wouldn't fix the size of the table. I also put it in the pile to be donated a few time but couldn't bring my self to part with it! Thank goodness.....after 10 bucks at Lowe's and 15 and the fabric store I turned it from small, ugly and useless to one of the most used pieces of furniture in the house! 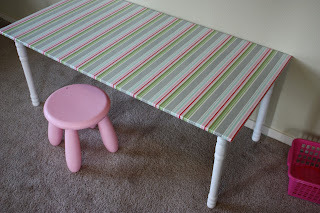 What you need: a small table with removable legs, a 2x4 piece of MDF ($5.92) at lowe's, primer and paint, and 3/4th's yard of laminated fabric(usually comes on 50-60" widths), screws and a staple gun. Step 1: Remove legs - pay attention to how they are attached to your current table as you will want to re-create that. Mine were screwed to a small square of wood with threads for the screw on the end of the leg. I had to chisel of that small piece of wood for the new table top. Step 4: Fabric wrong side up, place table upside down on the wrong side of the fabric, trim fabric about 1 inch wide/longer then table. Staple fabric to the MDF starting in all 4 middle of sides and work your way out. Work with your corner folds to your preferance and staple down. Step 5: Turn table over and ADMIRE!!!!! 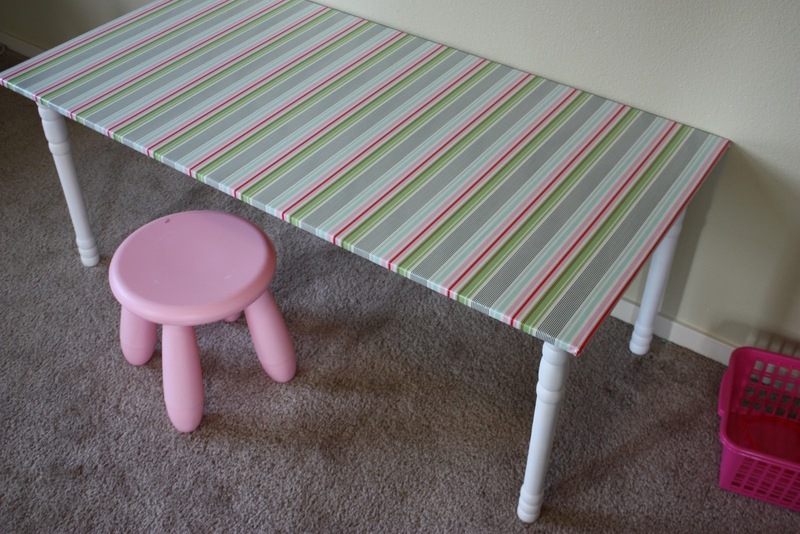 Laminated fabric or oil cloth is ideal since it is super wipe-able! Totally amazing.....Right!